Sonic the Hedgehog 15 is the fifteenth issue of the Sonic the Hedgehog comic series. It was released in October 1994. This comic features three stories: Rockin' the Bot, What's the Big Idea?, and Animal Magnetism. During a lightning storm, Sonic shows off his speed by avoiding lightning bolts and staying dry by running between rain drops. On his journey, he comes upon a frog stuck under a tree that has been struck by lightning. He runs over but looks up to see a mudslide coming toward the frog. The frog demands Sonic runs away, but Sonic, in his style, runs toward the frog and saves him just as the mudslide arrives. He saves the frog, but gets covered in mud. The frog thanks Sonic, thinking he must be magical like he is. Sonic gets up out of the mud, but thinks the frog is joking. It starts spouting some phrases, which cause three colorful rocks to fall from the sky. It gives them to Sonic, claiming each one will endow him with a special power: green for strength, red for elasticity, and yellow for leaping great distances. Sonic is pessimistic but takes them anyway. They go separate ways, with the frog warning Sonic that the effects of the stones only last for a few moments. Sonic, however, decides to give them to Tails on his way back home. A few days later, the Freedom Fighters are testing out Rotor's new land rover to help them get across the treacherous Mobian Badlands. Rotor is, however, concerned about Robotnik coming around. Tails states he's confident that Robotnik won't come around, as he has the three 'lucky' stones that Sonic gave him. Tails luck won't come in handy, as Robotnik is already nearby. Snively reports to Robotnik of the Freedom Fighters in their crude vehicle making their way through the Forbidden Zone. He orders Snively to destroy their vehicle in their new Beetle Bot. As the Freedom Fighters continue on, suddenly a large shadow looms over them. The group look around, but can't figure out what it is, other than being from Robotnik. Rotor looks up and sees Robotnik's large beetle-shaped vehicle swooping down on them and yells out. Everybody jumps out of the land rover just as Robotnik fires lasers, destroying it. The Freedom Fighters fall down a cliff, along with many parts of the rover, and make a rough landing. Robotnik lands the Beetle Bug over the cliff and orders the Freedom Fighters to surrender. Although trapped, Tails takes out the stones, but Sonic asks for them, just on the off-chance that they are actually magical. As he looks at them, he forgets what exactly each one does. Sally yells out to the others as they all look up to see the Beetle Bot holding a large boulder, and throws it at the group. Sonic takes out the red stone, thinking he'll get the strength he needs to get rid of the boulder. He holds it out, and ends up getting flattened like liquid, making Antoine faint. Although the others think he has died, Sonic squeezes out, telling the others he accidentally used the stone that makes the holder flexible. Robotnik, meanwhile, orders Snively to take the bot down into the pit and to capture the other Freedom Fighters to lure Sonic. As the others run, Sonic remains, contemplating which stone to use. With Antoine, Rotor and Bunnie caught against a cliff wall, and Robotnik heading toward them with a claw, Sonic takes a chance and uses the yellow stone, hoping it's for strength. He runs at the claw and goes to slam into it, only to end up bouncing off of it high into the air. He hits the ground hard, with the green stone in hand, which he knows is the strength stone. As he returns back, he sees the rest of the Freedom Fighters caught in the claws of the Beetle Bot. Before he can react, it starts to take off for Robotropolis. As it will be in the air, Sonic realizes his strength will be useless, but he gets an idea. He grabs a large trunk of a dead tree and cuts a large slab of rock out of a nearby cliff. He stands at the end of the cliff as the bot takes off. While laughing, as the bot flies up, Robotnik comes eye-to-eye with Sonic and sees his creation: a large rock fly-swatter. Sonic slams the bot with the swatter, causing it to fall. He runs down and stops the bot from smashing into the ground and helps release the others. Sally asks where Sonic got his powers, making him realize that the frog from earlier was actually magical. Later that day, Rotor and Sally join Sonic in a marsh, who is checking every frog to try to get more magical stones. The Freedom Fighters are standing outside Rotor's workshop, where he has stayed for a week working on a secret project, leaving the others curious. Sonic reminisces over previous innovations that Rotor has made, including a formula for a carbonated milkshake that ended up exploding. The others remember, having had to clean the walls of his workshop for a whole week, and making Antoine never want to drink milk again. Sally remembers another innovation: where he tried to add bread and jelly to peanut butter to make it easier to make, but it turned out as a visible disaster. Tails snaps his fingers, coming up with what Rotor might be doing: working the bugs out of his Universal Frammistat (a large computer). Bunnie asks what he's talking about, while Tails has no idea what it is himself. This makes Bunnie think about what he's doing, imagining him developing a self-cultivating garden that she can relax in. This whole conversation has led to all the Freedom Fighters coming up with their own ideas. Sonic thinks he may be working on a nuclear-powered skateboard, which Sally thinks is a dumb idea. She introduces her own idea of glow-in-the-dark popcorn, which Sonic rebuts with a stay-fresh lightbulb. She gets back at him by telling him that lightbulbs don't spoil, making Sonic wonder why they are put in refrigerators. Sally tries to come up with another innovation to beat Sonic, but is fresh out of ideas and admits she can't imagine what Rotor is doing. They decide to wait it out, but don't have to for long when the door explodes. Rotor walks out in the middle of smoke announcing his newest invention: the thermos, to keep hot things hot, and cold things cold. Unfortunately, Sonic doesn't think it'll take off, as he shows off a Sonic the Hedgehog thermos, and a Sonic the Hedgehog lunch box for it to fit in. A bored Robotnik and Snively watch a video on their large screen: Bunnie Rabbot holding up a large twig supporting a swing which Tails is on. Robotnik is disgusted by the scene, but Snively notes it is the only video he could find. Snively goes on about the details on Bunnie, even though Robotnik is well aware of her. In fact, he has developed a plan to use her to bring about the downfall of the rest of the Freedom Fighters. In the Great Forest, meanwhile, the Freedom Fighters are preparing a barbeque with Sally and Antoine on watch for Robotnik's forces. Rotor is preparing his own speciality, but with a twist, barbecued Mobian Mush. Despite the twist, Sonic is disgusted. Bunnie runs over to the group with a ladle that Rotor needed, until it flies out of her hand. Suddenly, all other metallic objects fly away from the group as they duck to avoid them. Sonic realizes that only metal is being taken away as Bunnie starts to fly away with the objects. Sonic chases after Bunnie, but is stopped as he witnesses Robotnik's arrival in his newest creation. Robotnik has arrived in the Great Forest in his Magnabot, a tracked vertically-inclined vehicle with a large magnet at the front of it. Sonic looks over as he hears Bunnie, who is holding onto a tree, but is losing her grip. Suddenly, he's hit in the head with a can, giving him an idea. He grabs a trash can lid just as it passes by and races out of the magnetic field before he's attracted to the magnet due to the lid. Outside of the field, Sonic taunts Robotnik. Snively notes the field and recommends they widen the arc. Robotnik, however, plans on turning the Magnabot quickly and cranking the power up to catch him. He gives the order, as Snively turns the Magnabot and puts the magnet to full power. Sonic, in the meantime, has started running aside. Snively decides to continue following him. 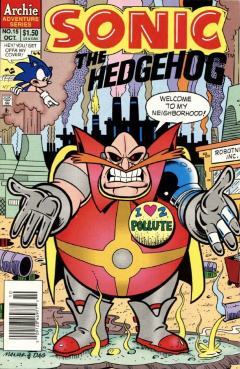 Unfortunate for Robotnik, he realizes Sonic's plan too late as the Magnabot has been turned around to face Robotropolis. The two watch on helplessly as the full power magnet pulls numerous badniks and metal from Robotropolis. With the bot and magnet overwhelmed with metal, Sonic grabs Bunnie and takes her to safety. Back in Knothole, to prevent the magnetism issue from happening again, Rotor coats Bunnie's metallic parts in an anti-magnetic solution. The Swatbot/personnel shuttle used in SatAM makes its first appearance in the Archie comic, being some of the objects attracted from Robotropolis by the Magnabot.